Learn how to make my classic Vanilla Birthday Cake Recipe with Buttercream Frosting and I’ll show you how to make the best vanilla cake recipe and decorate it simply and impressively! Every Bold Baker needs a Master Vanilla Birthday Cake recipe with Vanilla Buttercream Frosting. A vanilla cake recipe is a must have in your repertoire. I promise you this cake recipe will never fail you and you will have it for years to come. This cake is a classic with a lovely vanilla flavor. It is soft and light and the buttercream helps make it a simple, big slice of heaven. I know my strengths as a baker and cake decorating is not one of them. So what I do is use the simplest technique to get over-the-top results like this beautiful Birthday Cake covered in sprinkles. Don’t worry if you are not a great cake decorator. Adding Sprinkles covers a multitude of sins. Your cake will look flawless with my method. You cannot beat a classic Vanilla Cake, it’s one of my favorite. 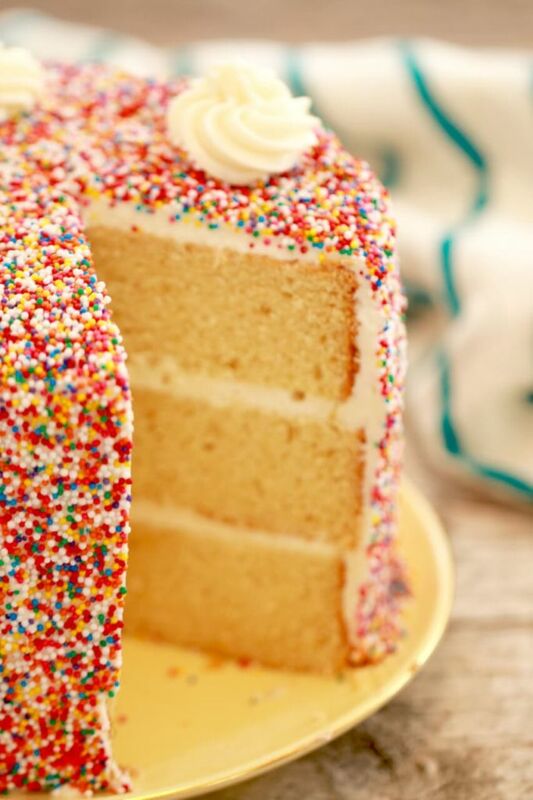 The sprinkles on this cake make it over-the-top amazing! When making your next celebration cake remember you cannot go wrong with Sprinkles!!! Just when you think you added enough, add MORE! Once decorated, this cake keeps well for 3-4 days in the refrigerator. This Vanilla Cake freezes really well and can be kept for 4 weeks in the freezer. This Birthday Cake is best served at room temperature. The flavors and texture will be much better. Find my Vanilla Buttercream Frosting recipe here. And you can use this cake to make my Lemon Meringue Cake recipe. I really hope you give my recipe a go and enjoy the best vanilla cake recipe! Don’t Miss a New Recipe! Sign up for my FREE Email Newsletter! Thank-you Gemma!! !You and your cake recipes are famous in my family.I made the fudgy brownies, vanilla frosting cake and a chocolate orange cake with a twist in the vanilla cake recipe.All on different occasion. Please suggest if I need to bake a cake in a round tin , size of 6 inches, how do I take the measurements or is there a separate recipe for smaller portions? I am the worst person in the world in math! Well, maybe not the worst, but close to it! However, this Vanilla Cake recipe is made in three 6 inch pans. This means that 1/3 of the recipe wil make one layer. I will leave the calculation to you as I do not know how you measure, it will be easier if you are weighing the ingredients. Thank-you Gemma.Sure I shall give it a try with the 1/3 measure.Yes, I have been weighing the ingredients. Can you tell me how many sprinkles did you use as I need to order from the web a specific colour ? I actually just measured them the other day for a different reason and it was about 1 1/2 cups with is 12ounces. I’ll add that to the recipe. I’ve been making this recipe with a few of my own changes for almost a year now. One thing I’ve never done is freeze it. My daughter is making her first communion on May 5th and I’d like to get as much prep work done well before that day. I’m going to be making cupcakes with this recipe. What would be the best way to freeze them? I dont think I’ve ever frozen any cake. Thanks so much! Hi, great question! You can freeze them in an air tight container for up to 3 weeks. To defrost just allow to sit at room temperature, this may make them a little wet or change the texture just a bit, but they will still be lovely. I’m delighted to hear that!! Thanks for trying out my recipes. Really glad to have you as part of the community. I have tried your ice cream recipes…it turned out well for me. Thank you, I am happy that you are baking with us. For a single layer cake, given the same size pan, you can simple divide the recipe by 3. When you adjust a recipe you always write or print it and go through ever ingredient carefully, divide as you wish, and there you have it. you can do it, it is math! Hi im wanting to make a three layer cake but only will be making one or maybe two cakes at a time and using a 8inch (3inch high) tin. Do i need to adjust the recipe and cooking time if so how much please? Shanna, meant to say you will bake at the same temperature, but you will need to monitor the bake according to how your oven cooks. My name is Anissa from Indonesia. I want to try this cake recipe for my husband’s birthday on Saturday. Can whole milk be replaced with full cream milk? because in my country only sells full cream milk and low fat milk. yes you can use whole milk no problem. it will give the same results. Hi Gemma: This cake is heavenly! My son turned 28 last Saturday and I made this cake for him. Definitely a hit at the party and with him. He loves Orange Chicken so I flavored it with a hint of orange juice as part of the liquid in the cake and the frosting. He also eats, sleeps and breathes Tom Brady of the New England Patriots (who wouldn’t) so it was a football cake as well. Made 2 8 inch layers and 1 6 inch layer. Cut them in half down the middle and after frosting each half put them cut side down on my serving plate then shaped it to look like a football and frosted the whole thing complete with laces. Thank you for this recipe. It will be in my “GO TO” recipe box for sure. thrilled to hear that, Karen!!! Thanks for trying out this recipe. Make sure you save it now to use in the future. Hello Gemma I love ur recepies .I just have one request plz plz plz bake eggless cake so that we I come to know about quantity of ingredients and get an idea plz . Really glad you like my recipes. I’ll add an eggless cake to my list no problem. Thanks for the great idea. Thanku thanku thanku so much and love u always I will wait for ur eggless cake video . I am overwhelmed to see the response your receipe received. I would like to share that I am a lacto vegan and would like to bake a super soft, airy sponge cake which is in no way dense. It would be great if you can share your wisdom to help me find a replacement for egg. The replacement shared by you is for 1 whole egg but for ‘whites’ it is amiss. Would be glad if you can share a recipe for lacto vegans to relish the scrumptious bites. Thank you. This is he conundrum! Egg whites are part of the leavening of many bakes. get to know aquafaba, this is ideal for things like meringue. We used this in this recipe (https://www.biggerbolderbaking.com/vegan-chocolate-mousse/). aquafaba is the whipped ‘water’ in which things like chick peas have been cooked. the canned ones produce a good thick version which whips up really well. Thank you for your valuable suggestion. Pls guide me about the quantity of aquafaba I should be using to substitute egg whites. Why did you use more egg whites and only one yolk? Is there any specific reason or to get cake in white color rather than yellow? I’m tiered of trying cakes to get bakery style texture,color and at the same time it should taste good. I tried cake flour with sour cream once but we did not like the taste as we feel little sourness in cake. I tried many times with All purpose flour. But I’m getting yellowish shade and denser cake. Finally I wanted to try your recipe. This is a white cake! The egg whites are part of the leavening of this cake, it tends to be close textured and relatively light. I have posted my cake picture in pinterest and I will post it here as well. Thanq so much for your patience in answering our questions. Really love u. I will definitely try painted cake also as you suggested. Hey BTW I made this cake with cake flour on last Saturday for my husband Birthday. Omg really delicious and Im not able to express how tastey it was. Everyone liked it. Thank you so much. Next I’m going to try your pizza dough recipe. I’m delighted to hear that, great job! I made painted cake with cake flour.It was really light and fluffy. Thanq so much. I have a question. Can we replace any cake with cake flour even recipe calls for All purpose flour.? Hi, i’m delighted to hear that, i would not suggest that as it can change the over all texture of the cake. So I should stick with same flour which has mentioned in recipe. Thank you so much. take a look at the protein content in the flour, this is how gluten is expressed. All purpose flour is a white wheat flour, which is also described as plain flour. It has no additions, such as raising agents. It has a gluten content of about 11.5% though it can be higher. % Gluten is described as protein on flour packs. Bread Flour/Strong Flour is a high gluten flour which contains about 13% protein, and it is, of course, best for bread. Pastry Flour/cream Flour is finer, lower gluten, 9 – 10%, kind of flour that is best suited for sweet baked goods like cakes and cookies. It has a very soft texture. Cake Flour is even finer and lower in gluten 7.5 – 9%, than pastry flour. It might be good for baked goods that need an especially soft and fluffy texture and do not need to withstand a long proofing process. So, really it is a choice. When you handle a plain all purpose flour with a light hand then the gluten will not be developed and all will be well. Learn to handle your mixes so that the gluten is not developed and all will be well. It really helps to have just one in your larder too as flour is best when fresh! Hi Gemma! I tried two of your recipes Condensed milk and Ice-cream. We loved that. I wanted to try vanilla Birthday cake recipe as well. But I have 9 inch cake Pan. Can you tell me the ingredients measurements for single 9inch cake? I just wanted to try for one round and then I will do Birthday step. Gemma, in your response to Anusha, my math comes up with different numbers. Three 6″ round pans is 84 sq inches, not 54. And a single 9″ pan is 64 sq inches, not 81. The math formula for one pan is Area = Radius (squared) x Pi (which is 3.14). So for example, a single 8″ round pan is 4″ (squared) times 3.14, or 16 times 3.14 = 50 sq inches rounded. Hope this makes sense. I have no idea what I was thinking, and I have to bow to your knowledge, i am a baker, not a scholar!! Math is not at all my thing. I calculate simply, just to give a broad idea. So, 6×6 = 36 x 3 = 108 sq inches, and 1/2 of that is 54 sq inches, but this is not taking account of the volume of the pan, as I am presuming a shallow sponge cake pan. 9 x 9 = 81 sq inches according to me! I do know that this is not perfect math, and I do not understand it fully, I may need help with this for accuracy, but it works for our simple purpose. I take your point though, I would not be able to argue it in any case, mats was always the bane of my life! Thank you for responding! I also stumbled across a weblink that had a concise table to adjust recipes for different size pans. I didn’t make a note of its link, just Googled. Can I bake this as a single cake in 25cm baking tin. Hi, yes i would maybe bake it 5 minutes longer. Great idea! Thanks dear. I made it but top side is hard. Once it cooled I kept in the fridge.next morning I checked and it is hard😔.why? Any idea. But let me tell you, the taste was superrrrr.i loved it . That’s very odd, perhaps store it at room temperature and see what happens! I have tried to share my photos with you, but its showing as uploaded but couldn’t find it. Hi Gemma,To make an eggless cake what can the quantity of eggs be replaced with as you gave options of banana,Apple sauce,tofu or buttermilk?A pointed out option will be appreciated.if will there need to be any alteration for the rest of the measurements? Actually I want to make a bit more bigger cake. So how much more measurements should i add? Well, haha, when you say bigger you need to say how much bigger. If you tell me the size of the pan I can try to help you. Generally it is just math. You need to multiply the ingredients, one by one, by the amount you wish to increase the recipe. The square inch/cm size of the pan will give you some guide as to the increase in weights. Actually i want to make a little more big cake. So how much more measurement should i need to add? Hi, you can do 1 1/2 times the recipe of double the whole thing depending on how much cake you need. Enjoy! Thanks a lot!!! Actually we are buying a new car, so I made the cake to celebrate and it came out really really well. Maybe I’ll post the pic. Can I use this recipe with fondant? Tried it and loved it. I have a question: i’m wondering if I can use this recipe and divide the batter into two, vanilla and choco, for a marble cake? If yes, can you please tell me how much cocoa powder I can add in half of the batter please? Yes that’s a great idea i would add 1/3 cup cocoa powder but i may change the texture. Let me know how you go! Hi Gemma, This is Himanshi from India. I found your videos on YouTube and I am a big fan of yours. I am a beginner at baking and honestly your recipes helped me a lot. Now I have started taking orders and soon want to start a bakery shop. Few things I faced issues at is that every time I bake using the same recipe, the outcome is different. I don’t know whether its coz of the products from different brands. My egg-less cake doesn’t come out fluffy. The reason eggs are commonly used in baking is that they give the best results. When you change this you will get a different result, it cannot be the same. Traditional cake recipes are designed for eggs. That said, there are good alternatives. (https://www.biggerbolderbaking.com/egg-substitutes-for-baking/). Matching the sub to the recipe really helps too, flax egg or applesauce are best for a sponge type cake. If you experiment a bit you will get this right for you. Technique is so important too, mixing, not over mixing, are all vital to a great outcome. The temperature of the oven too, it needs to be consistent for good results. You can use either one, buttermilk gives a tender crumb, but whole milk will be good too. I have a recipe here for a buttermilk substitute, if you do not have it to hand. (https://www.biggerbolderbaking.com/homemade-buttermilk/). Hi Gemma, could I get away with using 7 inch cake tins or will the cakes be too thin? Thanks, loving the site! The 7×7 inch pan will be about 1/3 bigger than the 6×6 inch pan. You can increase the batter if you wish, or, as you say you will get a thinner layer, but that will be good too. Watch the baking time, it will reduce if you go for the thinner layer, and increase if you increase the batter. Keep an eye on it at about 15 minutes in to the bake, a peep into the oven will do it, when it is nicely browned on top it is likely to be baked, then you can test it. Is it necessary to use whole milk? I usually only have lite milk. Hello, no you can use whatever you have. Made this cake and it came out fantastic! (I know because I cut off the tops to level it and then did some quality control 😉 ) really so delicious – thanks for the recipe! I actually made it a couple weeks ago and froze it, fully frosted, with your buttercream frosting, for my daughters birthday this Sunday. Please please advise – what is the best way to defrost it?! It’s wrapped well in plastic wrap and then in a ziplock. Hi there, wow very handy great idea, i would suggest just letting it defrost in a cake stand at room temperature so you don’t have to move it around once its soft. Hi Gemma, love your recipes.. Can I substitute butter with oil..
Too dense, heavy and gummy. I think the instruction to use cold butter is off. I tried a 2nd recipe where you cream butter and sugar first – came out much better. Pics are pretty but did not like the results. there are different results with different methods to be sure. I have found that this recipe has worked really well for so many people, and not so much for others, and I am not too sure why! Can I use powdered milk missed with water instead of liquid milk,thanks. Yes you can in this case 😀 Enjoy! U frosted ur cake without making the sponge moist. Does this cake not need added moisture to get those melt in the mouth sponge feeling. I never do this! I do know that that is a tradition in some places, but not where I come from. I find it unnecessary. Hi Gemma, my family loves this cake so much. Is there any way I can make this a lemon cake? I know you have other lemon cakes recipe however would love to stick with this recipe. Great idea, sure you can add lemon zest and juice or extract 😀 Enjoy! I’ve been making this recipe for around 2 months now. In my previous review, I said I had a hard time finding cake flour so replaced 6tbsp of AP flour with cornstarch and subbed out 1/4 cup of butter for oil. I finally found cake flour and just made a cake for someone (I still subbed out the same amount of butter for oil). Such a huge difference with the cake flour! Definitely worth more than five stars! Thanks for a great recipe! Now to find a chocolate one that’s just as amazing. I already have an excellent chocolate cake recipe but the batter is very soupy and I need a thicker one to make half chocolate, half vanilla cupcakes. I just made the cake and smells really good! I am sorry that this happened for you. There are just two possibilities I think. 2 there is something off with your oven temperature. Ovens vary, there is no such thing as a precise baking time for a recipe, checking/monitoring is always really important. In this case it sounds like the cake needed about 10 more minutes in the oven. Can u add coco to make one portion chocolate ? I would not add cocoa to this recipe. Can you use this same recipe but put into cupcake pans instead? Yes you can, and you can also check out the Crazy cupcake recipe, a great standard sponge recipe for all of your baking too. (https://www.biggerbolderbaking.com/crazy-cupcakes/). Hi can this be done eggless ? I added 4 teaspoons baking powder and my cake cracked in the pan itself. Also, the center part was soggy while the edges were really rubbery and hard. I followed your measurements exactly the way you’ve put. Oh I’m sorry to hear that. I haven’t heard that before about this cake. I hope you were still able to use it. this is not a recipe issue, but an oven issue I think! tell me about your oven, is it an OTG? How do you get the sprinkles to stick to the cake? Also are there any sprinkles in particular you recommend? Thanks so much! Love your site. Really glad you like my site. The sprinkles stick to the buttercream because it’s sticky. Just make sure you put on the buttercream and then straight away put on the sprinkles so it doesn’t dry. The sprinkles are called ‘Rainbow Non Pariels’. They are small and round. Lovely recipe, worked out really well apart from the colour. I used Waitrose sprinkles and they did not show in the cake as the picture does. Otherwise a great cake! Thank you for the kind words. Some sprinkles can bleed into the cake batter, and it sounds like this is what happened to yours! The stronger the color starting out too the better they will hold up. I am really delighted to hear this! Well done you, all your own hard work is paying off, that is amazing! Thank you too for sharing this with me, and with other bold Bakers, they will be encouraged to try too. Can i use all whole eggs or does it have to be all white? You can try adding 4 whole eggs Tania. I’m sure that will be fine. Yes! you can do this. The difference will be in the baking time, you will need to monitor it. When you adjust a recipe it is best to write it down, then change every ingredient as you wish, one by one, this is how you get it right. My crazy cupcake recipe will also be an easy sponge recipe to reduce or increase as it is proportional, and makes a lovely vanilla sponge. (https://www.biggerbolderbaking.com/crazy-cupcakes/).